Swamp cabbage (Ipomoea aquatic) is an edible flowering plant in the family Convolvulaceae native to Asia, Africa and southwestern Pacific Islands. 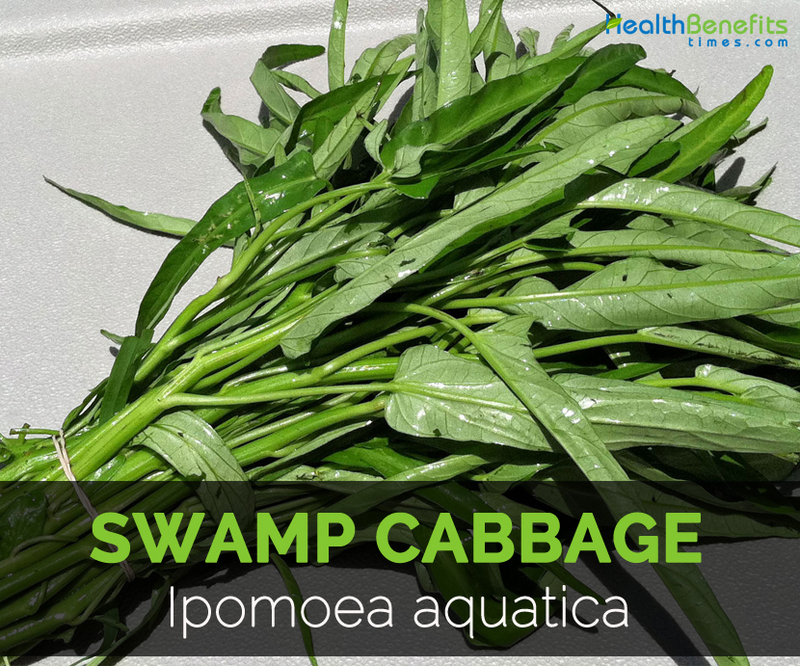 Swamp cabbage is known under various common names, including Water Spinach, River Spinach, Kangkong, Water convolvulus, Water Morning Glory, Chinese Watercress, Chinese spinach and Chinese convolvulus. It is a semiaquatic, herbaceous plant with milky sap which grows up to 3 m long. Swamp cabbage survives in tropical and subtropical regions. The leaves are alternate, simple, arrow head shaped-lanceolate, and very variable in size from about 5-15 cm (2-6 inches) long and 2-8 cm (0.8-3 inches) broad. The flowers are trumpet shaped, white and 3-5 cm (1-2 inches) in diameter maturing into oval or spherical, woody fruit 1 cm (1/2 inches) wide containing 1 to 4 grayish seeds. Ipomoea aquatic is native to Asia, Africa and southwestern Pacific Islands. 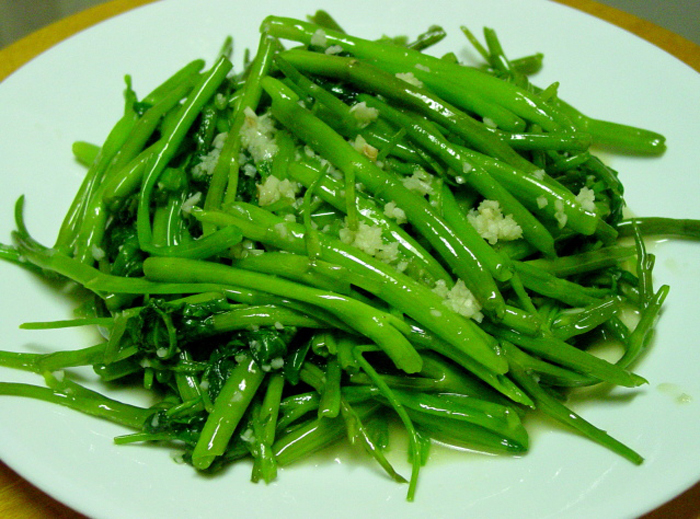 Since at least 300 A.D., it is used as a medicinal vegetable in the Southern Asia. Since 200 B.C. people started to cultivate it. 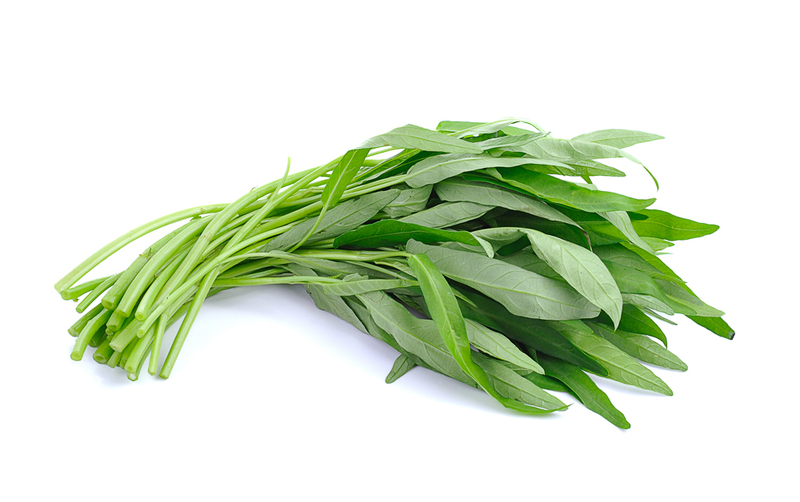 With the arrival of Europeans in the late 1400s, they are aware about its medicinal uses and started carry water spinach around the entire world. 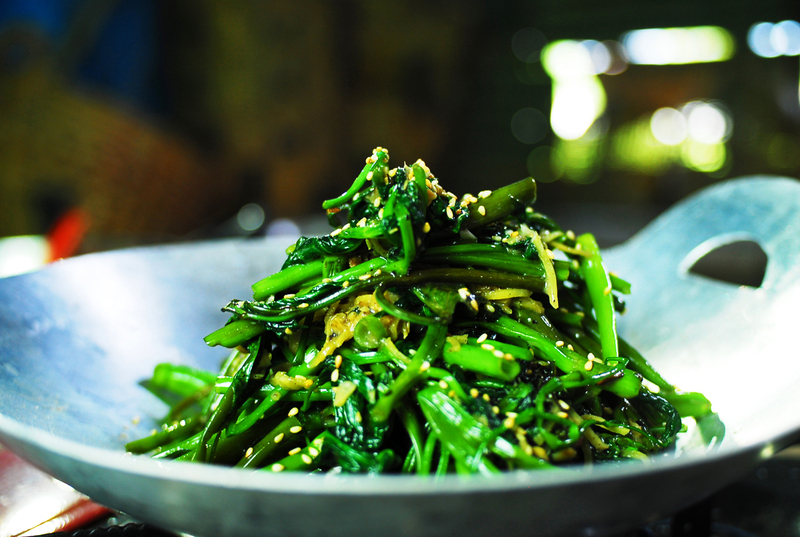 Water spinach was believed to be cultivated in Southeastern Asia and domesticated in India and China. The serving size of one cup about 56 grams provides 11 calories. The same amount offers 1.46 grams of protein, 0.11 grams of total fat, 1.76 grams of carbohydrate and 1.2 grams of dietary fiber. 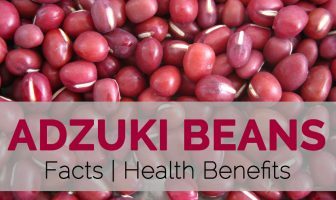 In addition, it provides 30.8 grams of Vitamin C, 176 µg of Vitamin A, 0.94 mg of iron, 40 mg of magnesium and 32 µg of Vitamin B9. The study shows that high intake of Vitamin C reduces the appearance of wrinkles, slows down the aging process as well as skin dryness. Vitamin C is vital for the formation of skin, ligaments, tendons and blood vessels. It also speeds up the healing process and forms a scar tissue. The cream with Vitamin C reduces the duration of skin redness. The diet rich in antioxidants helps to maintain the healthy skin and also prevents from skin cancer. The digestive system must be able to absorb the nutrients from the food in order to function effectively. The nutrients are absorb on the bloodstream and cells which assists in reduction of inflammation and disease growth. Vitamin C with iron raises the absorption of iron in children as well as adults. Vitamin C prevents the damage made by harmful molecules known as free radicals, pollutants and toxic chemicals. The buildup of free radicals in the body leads to various health ailments such as heart disease, cancer and arthritis. Free radicals are formed during the process of breaking down of food or when exposed to tobacco, smoke and radiation. Vitamin A possesses antioxidant properties that eliminate free radicals that are responsible for cellular and tissue damage. It also prevents the cells being overactive. Food inflammation and inflammation are the result of immune system being over reactive to food proteins. The intake of Vitamin A reduces the food allergies by the prevention of this harmful overreaction. The inflammation is reduced which also reduces the chances of neurodegenerative diseases such as Parkinson’s disease and Alzheimer’s disease. Vitamin A is able to manage the malignant cells which help to treat several types of cancer. It is well known that retinoic acid is essential for the cell development and to treat cancer. Retinoic acid helps to suppress the bladder, ovarian, breast, prostate, lung and skin cancer. The evidence shows that the molecular mechanisms found in retinoic acid helps to control the fates of cancer cells. Vitamin A is known as immune boosting vitamin because the immune systems depend on the Vitamin A for the functioning. It also helps to counteract the health conditions such as cancer, autoimmune diseases, illnesses such as common colds and flu. Vitamin A helps to enhance the children’s immunity. The study shows that the intake of Vitamin A reduced the child mortality by 24%. The deficiency of Vitamin A increases the chances of infections such as measles and diarrhea. The functions of neurotransmitter are dependent on the adequate amount of iron in the blood that assists a positive mood. The mood depends on the hormone balance such as dopamine, serotonin and other hormones. The low levels of oxygen cannot synthesize these hormones in the brain due to which one experiences low level of energy, bad sleep, poor mood and lack of motivation. The deficiency of iron in the body is the cause for restless leg syndrome. It also results in sleep disturbances. Iron is essential for the transport of oxygen to the muscles that reduce the chances of muscle pain as well as muscle spasms. The low presence of hemoglobin and red blood cells are the cause for anemia due to the low transport of oxygen to the cells. Anemia affects the brain functions, low energy level and low immunity. WHO estimates that about half of the anemia cases is caused due to the deficiency of iron in the world and the remaining others are caused due to the genetic factors. Magnesium helps to provide a sound sleep. The lower absorption of nutrients increases the chances of insomnia. The research shows that the magnesium helps to reduce the symptoms of insomnia effectively, enhance sleep time, efficiency and onset. It also promotes early awake and reduce the cortisol concentration. The buds are used as a poultice in order to treat skin diseases such as athletes foot, ringworm etc. It is also used to promote vomiting in case of poisoning. The mixture of Swamp cabbage juice and water is used as a cold compress to cure fever. The juice extracted from boiled Swamp cabbage is used to treat constipation. 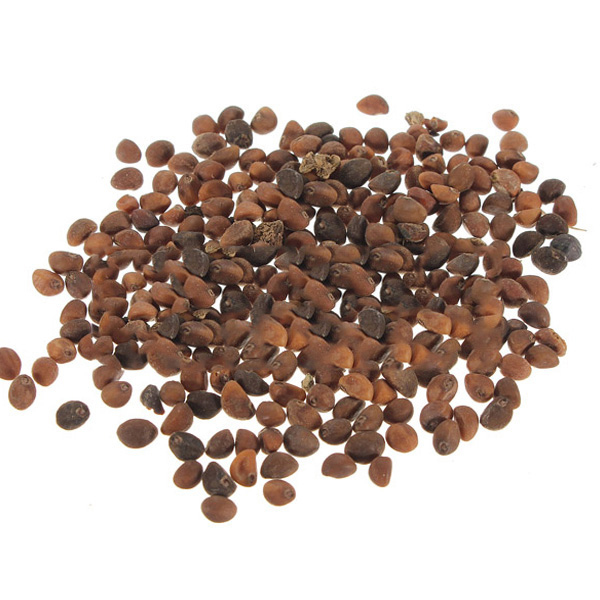 It is also used as a treatment for infestation of intestinal worm. Swamp cabbage is used in Indian Ayurveda Medicine as a treatment for liver problems and jaundice. 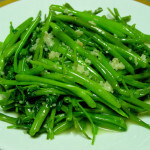 The leaves are helpful in treating diabetes in the pregnant women. It is used as a sedative to enhance sleep and relaxation. The sap is also used as an emetic, sedative and purgative and the flower buds are used to treat ringworm. In Sri Lanka, Swamp cabbage is used as a treatment for diabetes mellitus. 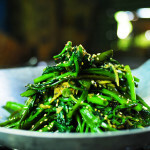 In Asia, it is consumed stir fried with garlic, chilli or savory paste. In Ipoh and Penang, it is prepared with cuttlefish and sauce that is sweet and spicy. In Vietnam, Swamp cabbage is used as an ingredient or garnish in cuisines. It could be sautéed in cooking oil, garlic, onions, soy sauce, vinegar and bouillon cube. 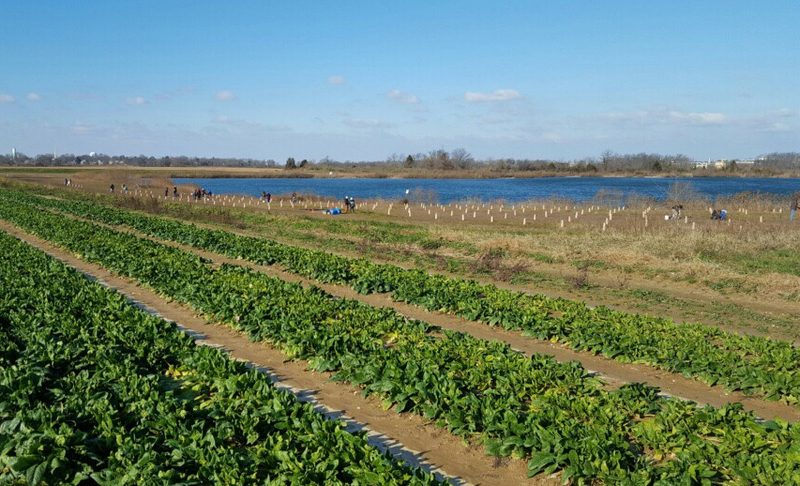 As Swamp cabbage does not last long, proper care should be taken. By refrigeration, it could last for two days. Those who are allergic to high calcium and fiber should not consume it. Cut Swamp cabbage into 3-4 inch segments and discard 2 inches of lower end of a stalk. Clean it carefully. Rinse at least two times to remove dirt or residue. Then drain it. Heat the large pan with oil and put crushed garlic. Stir fry the crushed garlic over a medium to high heat till it is golden brown. Set half of a garlic aside and remaining some garlic in a pan. Then add Swamp cabbage till it is wilt. Add some salt to release water. Reduce heat and cover it for about 1 to 2 minutes. Then add 1-2 tbsp. salted fish sauce, salt and pepper. The stalks should be slight crisp. Garnish with fried garlic which was set aside. Heat the wok with oil over high heat. Then add ginger, garlic and stir-fry it. Add Swamp cabbage and cook it till it wilts. Add sugar, bean curd and salt and stir-fry it for another 3 minutes. Garnish it with sesame seeds which is toasted. Then serve with a jasmine juice. Convolvulus incurvus Schum. & Thonn. Convolvulus rostratus Zipp. ex Span. Ipomoea natans Dinter & Süsseng. Ipomoea sagittifolia Hook. & Arn. Calories 11 Kcal. Calories from Fat 0.99 Kcal. Calories 20 Kcal. Calories from Fat 2.16 Kcal.